St. Paul’s Hall Huddersfield will be the venue for the band’s tribute and remembrance to the ending of World War One and other conflicts since. Put this date in your diary as you will not want to miss this memorable concert. Friday 9th November 7pm . St. Pauls Hall Huddersfield. TICKETS NOW ON SALE. SUNDAY THE 30TH SEPTEMBER SEES HADE EDGE BAND IN CONCERT WITH THE WELL KNOWN JAZZ TROMBONIST , DENNIS ROLLINS MBE. CONCERT STARTS AT 7PM; BAR AND REFRESHMENTS AVAILABLE. TICKETS FROM HADE EDGE BAND MEMBERS/HOLMFIRTH CIVIC HALL AND RINGING 07512 600602. TICKETS ARE £10 AND £7 FOR CONCESSIONS. AN EVENING OF PURE BRASS AND JAZZ TO BE ENJOYED BY ALL. 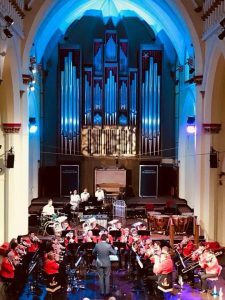 The start of the Autumn season of Concerts for the band commences with the following concert on SATURDAY 22ND SEPTEMBER. on Saturday 22nd September in St. Mary’s Church, Bolsterstone. Tickets are now available from Robert (Band ) on 07512 600602 and also from Stocksbridge Keys store. Prices are £8 for adults and £4 for under 16’s. To be held in the grounds of Carlecotes Hall and Church the Garden Party will commence from 2pm. Tickets are £6 adults and £3 under 16’s. Ticket includes entry, strawberries and cream and tea/coffee or soft drink. 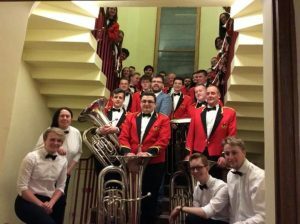 Thursday 28th June – Hade Edge Band Room – 110th anniversary concert- 7:30pm. Featuring all 3 bands. Pay on the door. Sunday 1st July – HEB competing in the Brighouse March Contest which commences at 1pm. 30 bands entered. Saturday 14th July – Durham Miners Gala – Durham City event. Saturday 21st July – Carlecotes Garden Party – from 2pm – pay at the gate. To continue the bands 110th anniversary year we are holding a concert in Hade Edge Band Room on THURSDAY 28th JUNE at 7:30pm. The concert will include our Trainer Band, our B Band and our Senior Band. Everyone is welcome and please pay at the door. The B Band will be performing their test piece at the above contest this coming Sunday at approx. 11am. This will be followed by the Senior Band performing their test piece in Section A of the contest which is expected to commence at approx. 1830 hours. There are 23 bands in total competing at this contest. A great day out for all. The band are holding the first of a number of events/concerts to celebrate the band’s 110th year anniversary. The concert will be held on Sunday 15th April in St. Paul’s Hall Huddersfield at 7pm. Please ring Robert on 07512 600602 to book your tickets or speak to any member of the band.